If there’s any doubt in anybody’s mind concerning what the western branch of this agency is about, please just refer to the photo repeatedly until you get it. And this picture is rather pretty compared to what really goes on when these guys are on a roll. Can this picture be sent to someone at the New York Times for publication throughout the country? Yup. Just “right click” on the photo and select “copy”, then open and e-mail to whomever you wish and “right click” in an open spot on the body part of the message and select “paste” and you’re there. Another way is to just send the link by doing the “right click” thing in the address bar at the top of the page while you have the thread open (same as if you were going to comment) and do the same thing in a message. I think I will point out the situation this photo poses; it is illegal for these agents to pose with animals they have killed as though it’s a trophy on a hunting day. 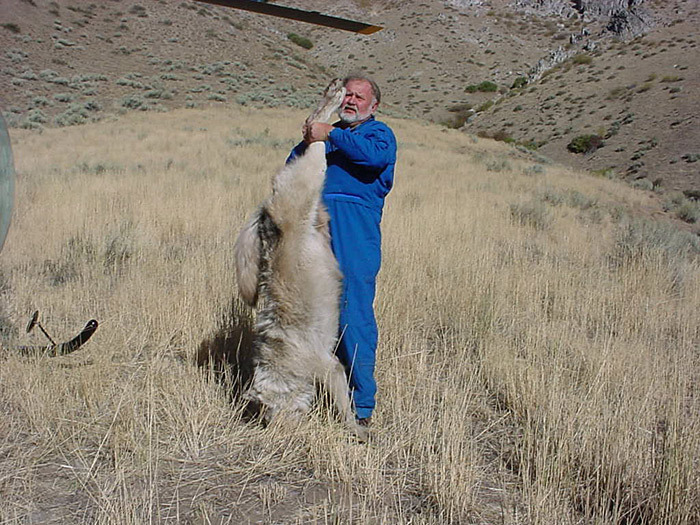 And here is the district supervisor for central Idaho posing with a wolf he just exterminated. Anyone else see something wrong with this “picture”, figuratively and physically? At the very least, ethically…. 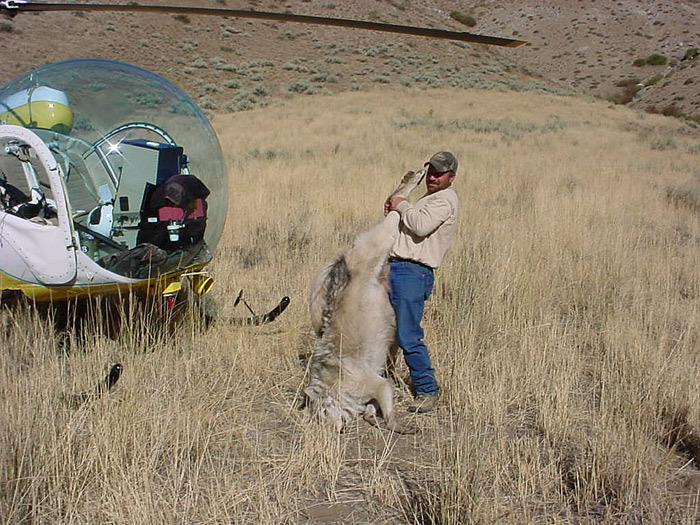 According to the fiscal year 2008 in the report supplied by this web site at NRDC, page 163, there were 82 wolves killed in Idaho alone and they claim they relocated or released 19. Do you ever think that someone just took a picture of him carrying the wolf to the helicopter — just a random shot. Elk275, does the update to post answer your question? I do not see the update to the original post, I see the original post. I now see there are two pictures and it still looks like it is a random picture. As far as carrying it by the legs: wolves and cat have very bad breath, and I would not want a wolf’s salvia in my face. It is no big deal, it is just an observation. It seems to me that the “documentation” would include a photo of the wolf with some article of scale, not a posing human doing the “weenie wave”. The photos show two people holding the same wolf. These were not just random shots, they were posed. Indeed. I forgot to mention that part. Elk275: you are too much. Bad breath? The animal is DEAD. I suspect that when WS claims they relocated/released 19 wolves, what really happened is that they trapped 19 wolves that they may or may not have radiocollared. According to previous NPT and IDFG annual reports, there haven’t been any wolves relocated in the true meaning (captured at one site and transported somewhere else) for at least 5 yrs. (and maybe since 2002). I believe you’re right. I am certain that no relocations have taken place for many years, and I do recall Ed Bangs stating that there would be no more activity of that sort because they would likely be “dumped” on other wolf packs in the new locations and, therefore, given a sure-fire death sentence. I can’t remember exactly when that was but it could have been as early as 2000… not sure of the date on that one. The only reason that WS would have released a wolf from a trap would be if they had placed a collar on it and then let it go so it could lead them to the rest of the pack so they could kill them eventually. Not that it matters, but these photos are over a year old and wolves were not delisted at the time of the pictures. Actually this photo is almost 4 years old! The age of these pictures is not the issue. The manner in which or rather the reason they were taken is very fitting to express the issue at hand. that issue is that the WS crew in Idaho in particular, have no respect for the wildlife they dispatch at will and the manner if which this is done is questionable at best. The issue is that their ability to carry out the deed at great expense to the taxpayers of America and that they are not accountable to anyone, it appears, means that this sort of “under the radar” killing of wolves is taking place with the stated intent of reducing the Idaho population of wolves to such a low number that their retention/recovery is at stake. The pictures indicate the absolute disdain these social parasites have for wildlife in general, a visual to assist in clarifying the gist of the article in which they appear. ‘s it make sense now? I suggest you go back through the two years of posting I have done on Ralph’s blog and notice how many times I have said that Wildlife Services were the biggest issue to the survival of wolves. The point dating the picture is this stuff happens whether wolves are delisted or not. Many people have an out of sight out of mind mentality, when it comes to wolves. They think that as long as they are listed that they will be safe, when in actuality wildlife services have and will continue to kill more wolves than hunters ever will. Come now, there are plenty of slob hunters out there who also deserve all the scorn they receive and more. In too many cases, it’s all about the mere childish thrill of killing and an excuse for subsequent locker room strutting. Why waste wildlife on that? It was hard to tell that from those two comments. I know that, I am one of them. I am glad that Ken posted this article, or whatever you call it, from the NRDC blog site ~ with these old pictures. It’s important info and I agree that WS needs to be dismantled and replaced by something else that takes ecological factors into account not just what the ranching gang wants. Among other factors. The reports included in the text at the blog site are very telling as are the photos. Mikarooni long time since you came and posted some facts for us, mind providing a link to back up your statement? I think we can both agree that the LAST thing ID or MT or WY wants is for wolves to be relisted for ANY reason. That statement is just made to make those that are uniformed feel that the very existence of wolves in the Rockies is threatened, and we both know that is false. These pictures are just the tip of the iceberg. Sorry Josh, I don’t agree. The stated intent and the actual state position in Idaho is that they wish to remove all wolves from the state by any means, this has not changed to my knowledge, and I do pay attention. The statement is not made just to create some false idea for the “uninformed”. It is the truth. A “robust and healthy population” of wolves requires far more individuals than you care to agree to is the problem. With so few wolves and with no realistic means of genetic exchange with other populations means that this PDS (distinct population segment) of wolves will not last long if they are reduced to inbreeding and subject to indiscriminate eradication via WS and their cohorts in IDF&G. Hunters are just there for window dressing. The breaking up of packs, by hunting, will facilitate the growth of lone wolf population, who by the way are not breeding pairs nor are they likely to breed. This is a probable scenario, based on years of research, not just an imaginative creation of fearmongering. I don’t know what you do or don’t know, but I do know that what I was writing about is not false, regardless of what you think you know. I have been dealing with this issue for a long time now, interact with the researchers who have conducted these studies for over a decade and have argued before governors, F&G commissions and Congressional members as well as USFWS regional directors over this issue, I know at least a little bit about it, including the science. The fact is, if Idaho gets rid of most of the wolves, they will argue that there should not be more reintroductions… think about that for half a minute. USFWS will have a hard time reintroducing any more wolves even if they regain management authority. I suspect that this is one of the unstated goals. If the official or actual counts aren’t posted for the public to view, who’s to say just how many wolves are in the state? If there is no oversight of the IDF&G, just how will they be held accountable and how will the wolf population recover? How many actual hearings on this issue have you attended above the level of F&G so called public meetings? How many actual political figures have you discussed this issue with? I’m sure Save Bears can enlighten you on how these sort of gatherings go down and how frustrating the ignorance of political figures can be. Dusty alot of your concerns are just assumptions. ID has 1000 wolves that they know of living in the state. Thats a pretty robust and healthy population. Wolves are not going anywhere in ID for a very long time. They are in no immediate danger of being wiped out. From reading your posts thats what I feel you are saying. And I agree that wolves should not be removed for public land predations. Like I said that third criteria for delisting will always be the fall back strat to prevent delisting. Smart move by the wolfies. I’d be willing to bet that there are more wolves than a thousand in Idaho. Even on the updated wolfpack territory amps they have missed several North Idaho Packs. There sure won’t be 1000 wolves after the hunters, legal and illegal, and the WS finishes this winter’s assault. I wonder if the hunters on this site could give their opinion on the livestock industry in the West. There’s no doubt, is there, that without the industry using public land, there would be a whole lot more game, and better fishing too. There’d probably be buffalo hunting. Do hunters and fishermen think grazing rights should be cut back or eliminated? Or do they think the current situation is fair? Baring a favorable decision from Judge Malloy, Idaho will have a population of ~500 wolves, reduced to that number by the state thru the auspices of the fish and game dept by any means necessary as quickly as possible and kept at that number or lower. Managing for the least # possible. As a hunter, I have stated time and time again, I am for getting rid of public lands grazing, and if we can’t then at least make them pay fair market value for the lands they use, indigenous species should take first priority over live stock, has been my position, when I worked for FWP and will continue to be my position till the day I leave this earth! In North Idaho open range is not a problem, there’s very little if any, at least where I hunt and frequent anyway. Logging however, to me is a different story. I can’t believe how much logging is going on and it seems the state is doing most of it. Timber is worth zilch right now so I can’t figure out why their still logging. And I mean cutting the hell out of everything. My son talked me into hunting in an area that we had not been in for a couple of years and when we got there I didn’t even recognize it, looked like they took a lawn mower to the whole area. I’m not against logging by any means and many of my friends are loggers, they don’t even get it. I’ve seen some tracts done that you could hardly tell it was even logged and it actually looked better after they were done but I sure wish the huge clear cuts would go away. I’m with saves bears on the public land grazing, get them off or at least make them pay a fair price and then use that money for habitat. Hey, now there’s something we can all agree upon! Taz, As a Hunter I am opposed to livestock on public land. I agree with Save Bears. I too am a hunter of deer and elk and I say get the livestock of our public lands. PERIOD if the poor rancher can’t make it on their own private land then they need to find a new job and no more government assistance for them either. I had a small business that failed, you didn’t see me crying to the government for money. I have seen cattle and sheep do way too much damage to our beautiful public lands. I use to fish silver creek over in Picabo, in the lower part of the river a slob farmer would let his cattle right into the river, you know what that part of the river has never been the same. Of course after I first seen the cattle in the river I came home and started calling the BLM and raising cain, but even though the cattle are no longer allowed or at least I have not seen them in the river, it is not the same. I agree that the cows and sheep need to go home. As I have said many times before on this blog and to many officials and ranchers; if you don’t have a yard big enough for your doggies, you need to get rid of some or all of them. These ranchers are sucking off the public teat, far worse than welfare moms, though I am certain there are abusers of that subsidy as well. But they have no oversight, fail year after year and never have any kind of job review yet they are allowed to continue failing because it secures the subsidies endlessly. Can you think of any other occupation that allows for constant failure yet provides taxpayer “cover” for them to continue to do so? I don’t eat public land grazed meat, unless it’s deer or elk. If I do eat beef, it comes from “wolf safe” farms where appropriate precautions are taken to protect the animals from predators and all the grazing is done on private land, organically and locally. As a hunter and a public lands user, I am too upset about public land grazing on large tracts of public lands. But the question I pose is when there is public land interspersed with private lands how do we make a separation. Lets take a 10 section pasture,6400 acres, with a 1000 acres of public land in the middle with no public access and no fencing. The 1000 acres may or may not be one tract as it could be a 320 acre tract with additional smaller tracts scattered. The BLM has to get permission from the land owner to cross private property to get to the public lands or that a helicopter, I guess. I feel that a lot of isolated small tracts should be sold for FAIR MARKET VALUE and the money should be used to purchase other lands that will have better utility for the general public. Well, that’s pretty unanimous! I agree with everybody on that one. Maybe I’m missing it, but I never see any of the hunting organizations coming out strongly against public grazing. It’s a mystery to me why Wildlife (Dis) Services , f/k/a Animal Damage Control enjoys almost the same level of secrecy and lack of transparency as the CIA and NSA. The US Department of Agriculture a cloak and dagger agency ? But it’s just that in the case of Wildlife (Dis)Services. Try to find out even the most basic information from these guys. They laugh at FOIA requests and never get back to you. So we are forced to proceed anecdotally. I fee pretty confident The Public paying for all this would be appalled to learn of the base brutality of their wet work, the true costs , their predisposition to not consider nonlethal predator management options. For starters. They are paramilitary enforcers for ranchers, paid publically to do private work in a cultural throwback to the 19th century range detective era. Wildlife Services are out and out mercenaries of the Blackwater/Xe persuasion, the only people allowed to do aerial gunning in Wyoming ( and I presume elsewhere)— not that some ranchers don’t own their own Air Force and do close air support of their precious herds, legally or otherwise. Like the Cow Manager for the notorious Hunt Oil owned Hoodoo Ranches south of Cody who crashed his ranch foreman’s SuperCub airplane into a Wyoming Game Warden’s truck (!!!) when he was trying to land it and tell the warden to get those #@!ing elk off our pasture ! (true story, May 2006). But I digress. Most ranchers just call Wildlife(Dis)Services on a whim or twitch, and they come forthwith , a gleam in their eye , ready to assasinate anew. WS is just a tool of the cattle barons when it comes to Large Predator “Control”. All at the public’s expense…so it’s worth asking: what fees are directly assessed the stockmen for supporting this vital service? It surely can’t be AUM grazing fees, because those are already below cost just for the grass and office work. Does the Wyoming Stockgrowers Association pay a retainer to USDA Wildlife Services account for blanket coverage? Of course not . Does the rancher pay anything for Wildlife Services to be at his beck and call in proportion to services collectively rendered at the end of the fiscal year ? It’s a fair question. I think the entire cost of WS is generalized under USDA and cannot easily be parsed. But here’s an interesting sidebar: In my own anti-wolf Park County Wyoming ( Cody-Powell-Meeteetse-Wapiti-Clark) , the commissioners funded some additional county predator control parttime positions to deal with skunks and coyotes etc. in order to free up the local Wildlife Services agents to concentrate on the wolves. We have an extraordinary ratio of Cattle Lost to Wolves Eradicated here in Park County…WS kills more problem wolves than those wolves kill in cattle. The US Fish and Wildlife Service almost never refuses a rancher’s request to “control” any and all wolves that I am aware of. Please correct that notion if I am in error. Please—because it means Wildlife Services would have to tell us what they are, in fact, doing in order to set the record straight. I’m all eyes and ears on this one. Lay it out, guys. One little tidbit I was able to interpolate was the amount spent in Wyoming for coyote control ( total) divided by the number of coyotes eradicated came out to over $ 1000 per coyote in a year. I would hunch that the Per Wolf Cost of a year’s wolf eradication by WS would be ten times that average cost. Helicopters aren’t cheap. For instance, WS spent all summer trying to get a couple of black wolves that were dining on easy mutton in the Big Horn Mountains, and they failed , but the meter kept running from early June till late autumn. Of course WS does some good and valuable work , too, but that is quickly overshadowed by their penchant for secrecy and root ruthlessness. They give themselves and ranchers a black name by not being forthcoming and honest about their “services” rendered and costs thereof. And now, a closing rant. If you thought the Patriot Act gave agents of the US government a cloak to hide behind while they took liberties domestically , Wildlife Services could have provided some useful consultation on how to go about that. They hide in plain sight, kill things 24/7/365 , and are never held accountable for any of it. And they’ve been doing it all along. We sorely need some bright white light , a green visor, and a red pencil to scrutinize Wildlife (Dis)Services. Can the political obstacles to that forensic accounting process possibly be overcome? You tell em Dewey. These WS guys are criminals. How about the agency who administers that segment of public land requiring that the rancher separate their land from public land by fencing it? If there is truly a separation of ownership, there should be a physical separation to acknowledge that. I think a lot of taxpayer $$s that are spent by WS hit squad activities should be redirected to serve that purpose instead. Also, it would show “good faith” by the rancher that they are cognizant of their responsibilities as a land owner, lessor, or whatever on the border of public lands. A good neighbor sort of thing to say the least. The problem is that a good number of these operations gamble on the lax attention by BLM and others and use what isn’t theirs to use anyway. In my book of knowledge that’s stealing and it needs to stop. As Brian keeps saying: END PUBLIC LAND GRAZING/RANCHING, NOW!!!! One thing I want to see before I die is cattle and sheep off my ~ and your ~ public land. Dewey has made many valid points. I would also add that IDF&G have been taking training from them when it comes to nondisclosure of activity and facts. There are a number of different situations that need to be explored and discuss, but I have several reports that need to be into various banks by 8:00 tomorrow and I do not have time to write. Most western states are open range if you do not want their cattle on your land, private or govenment it is your responsibility to fence them off. That is the law of the open range. Regardless of one’s feeling either way it has been the law for over 100 years and to change it will take time and a change in the populus. Western states legislators are not going to change the law and western congressional members are going to represent there states. Given that fence out laws have been on the books for decades, and won’t be changed any time soon, why don’t we require ranchers that don’t want wildlife on their property to fence out wildlife? One can play the game two ways. No one here with half of a brain would want that, most private land tends to be in the best habitat areas, fencing out wild life would create huge barriers to migrations and lead to the loss of valuable winter range. I may have a little differing opinion, public lands ranching can be done responsibily in areas but it is currently not done that way in most areas. I would tend to disagree with the statement that cattle lead to lower big game animal populations as a rule, although in many cases degraded habitats do lead to issues with certain populations flourishing. That being said, I hate domestic sheep and they belong no where on the public landscape. There are several ranches that I know of that have the same issue with public inholdings surrounded by private, the issue is that Fair Market value and what the land is worth are 2 completely different items. Big spreads are going for 5-10K an acre right now, but they have access to their lands etc, the public inholdings are worth no where near that as they are landlocked with no deeded easements to get access. If the inholdings were sold off, what would be a fair price, and imagine the outrage if these parcels were sold off to another group besides the ranch owner in which the lands were enclosed. It’d be a mess that’d clog western courts for decades. BTW, SFW, OHA, REMF, and FNAWS have all purchased and ended public land allotments. Use the following link to find a stunning map showing BLM, National Forest and National Grasslands in the west that are and are not in grazing allotments. Under “Natonal Maps” click “National Forest and National Grassland allotments”. This doesn’t include state or other public lands that are leased. Where do you get this 1000 wolf number for ID? Last year’s annual report (the official estimate) stated ~850, and the 2009 estimate has not been made. There may at one time have been 1000 wolves in ID, including newborn pups, but their survival rate is not 100% and with the level of harvest and lethal control it’s doubtful there would be that many. Jay they estimated 850, those areas of the Frank Church and other wilderness areas are so remote and thick IMO there is no way to know how many of anything is back there. Not hard to miss a pack here and there. These pictures are proof in fact that idiots do in fact work for government agencies. I think there is plenty of room error in the wolf count estimate, with biases both ways even though the official line is that the end of the year count is a minimum. The latest bias I have heard in the direction of overcounting wolves is that the Idaho Fish and Game regions want as high a count in their region as possible because then they are awarded a higher quota in the wolf hunt. The annual state wolf population estimate is a conservative estimate. The estimate is derived from the most reliable data (# of packs confirmed with radio collar telemetry data, ground observations and other reliable metrics) but the data are not comprehensive and under represent packs we can’t verify. We know that we have at least the estimated number and that there are additional wolves not accounted for. If you can share any specifics on what you have heard about IDFG Regional bias contibuting to an over-estimate of wolf numbers in the state I am very interested. This is the first I have heard of this rumor. Critics of WS should also know they also kill wolves in MN, MI and WI. These “problem” wolves are on both private and public lands. For example, the wolves that eat about 1200-1600 farmed turkeys a year. The last published five year average for MN is 117 through 2005, with a high of something like 160 and a low of 90 (the average is accurate but the range might be off a bit). The high from the late 1990’s was something like 260 for MN. I have not seen any recent numbers for MI or WI. I work for the Nez Perce Tribe’s wolf project, and collaborate closely with IDFG on the final yearly wolf pop. estimate. I can assure you that there is no “padding the stats”: there is a formula (see Appendix A in the most recent annual report) that is applied based on the known # of documented packs (which is also determined by a protocol), average pack size (only those packs with what are believed to be solid/reliable winter counts are used to determine this), and a factor for lone wolves (taken from the literature- erroneously in my opinion as we have enough data from ID to calculate this). It is strictly based on what is actually known about the first 2 factors, but obviously not every pack in the state is known, so in the end it should probably be considered a min. count. Recall from an earlier thread on this blog a few weeks back, the declaration of Dr. Mech in the first Montana suit. In May 2008 Mech stated in writing and under penalty of perjury, that he believed the wolves in the NRM were significantly undercounted (the official number in late 2007 was 1545, and he believed conservatively it was over 2,100 in 2008, and that would likely increase over time (maybe even up to 3,000 in 2008, as they spread out and there were not sufficient resources to continue tracking them as closely as the first years when the numbers were fewer and the population more concentrated. (pp. 7-8; 12-13). Idaho gets its proportionate share of the excess of the undercount in the NRM, and maybe more, because of the higher rate of net increase over the last five years or so, even after discounting the harvest from the season this year as of Dec. 4, totalling 119 of the 220 quota. Well say goodbye to the Mitchell Mountain Pack north of Helena, Montana. Wildlife Slayers have the green light to take out the rest of the pack for killing a couple of goats and several guard dogs. Five members of this pack have already been killed, including the alpha female back in 08 when they collared one of her pups. Collaring makes it so convenient for them so they can track them down later for the kill. So let’s see….that’s the second pack slated to be eliminated since Nov. 23 when they gunned down the seven Basin Butte wolves in Stanley, Idaho. Plus we have the seven month long hunting season going on in Idaho, that runs though wolf mating season, with some wolves denning in mid-march and of course pregnant alphas have the chance of being shot. All in all just a great year for wolves. Nice job Idaho and Montana on “managing” wolves. How many tribal tags have the Nez Pearce filled this season? Zero as far as I’m aware. What happens to all those wolves that are killed by WS? Are they just left in the field? Are their weights recorded? Are the pelts taken? It seems an opportunity to collect valuable data. I know you are more trustworthy than some, so I stand corrected. But not completely trustworthy. You do well to maintain skepticism.